Taste test: These are excellent potato chips. 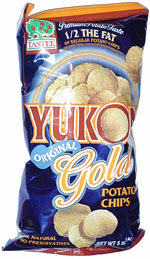 Lots and lots of Yukon Gold potato taste, no grease, good crunch, interesting color. Smell test: Oddly, these smell kind of like yuca chips.